While you’ve been hearing about virtual reality for the last 20 years or so, today the hardware required to build such a rig is finally to the point where it’s within the reach of consumers. 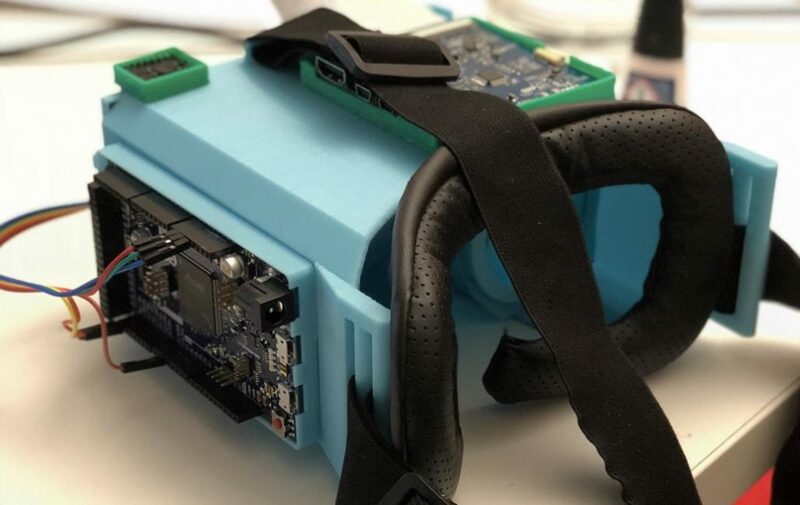 As seen here, Relativty is a SteamVR-compatible headset that can be made for around $100. Relativty uses a 3D-printed frame to house its 2560 x 1440 LCD screen, along with a pair of 80mm Fresnel lenses to properly focus the image. Control is accomplished via an Arduino Due and an MPU-6050 accelerometer, which feeds head-tracking info to an external gaming system. At this point, the device is clean though fairly basic, and will hopefully be the start of a truly excellent open source project as features are added. Like a lot of 16-year-olds, [Maxime Coutée] wanted an Oculus Rift. 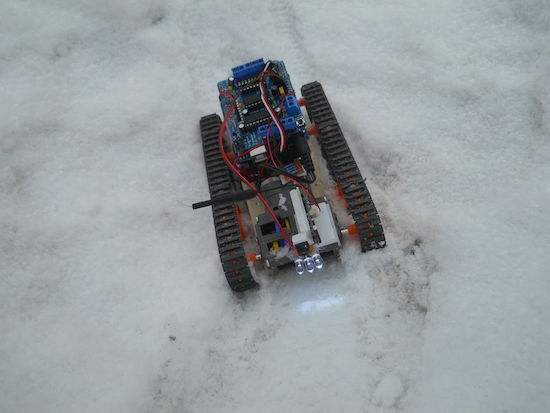 Unlike a lot of 16-year-olds, [Maxime] and friends [Gabriel] and [Jonas] built one themselves for about a hundred bucks and posted it on GitHub. We’ll admit that at 16 we weren’t throwing around words like quaternions and antiderivatives, so we were duly impressed. 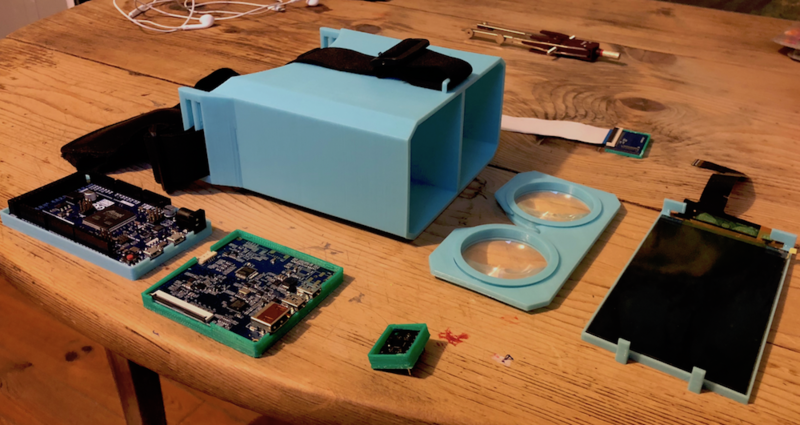 Before you assume this is just a box to put a phone in like a Google Cardboard, take a look at the bill of materials: an Arduino Due, a 2K LCD screen, a Fresnel lens, and an accelerometer/gyro. The team notes that the screen is what will push the price unpredictably, but they got by for about a hundred euro. At the current exchange rate, if you add up all the parts, they went a little over $100, but they were still under $150 assuming you have a 3D printer to print the mechanical parts. The system uses two custom libraries that you could use even if you wanted a slightly different project. FastVR creates 3D virtual reality using Unity and WRMHL allows Unity to communicate with an Arduino. Both of these are on the team’s GitHub page, as well. There was one other member of the team, their math teacher [Jerome Dieudonne] who they call [Sensei]. According to [Jerome] he is “… the theoretician of the team. I teach them math and I help them solving algorithm issues.” He must be very proud and we always applaud when someone takes the time to share what they know with students. We don’t know what’s next for this group, but we will be keeping an eye on them to see what’s next. Maybe they’ll work on smell-o-vision. 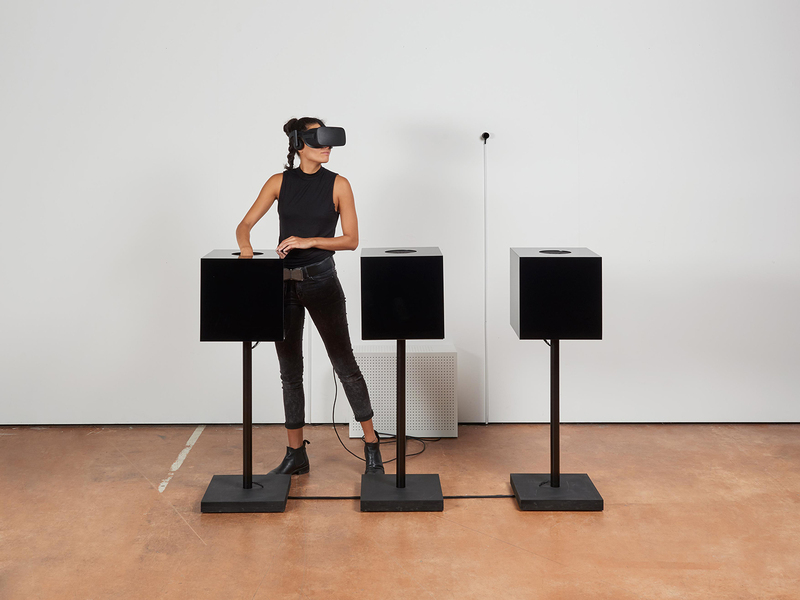 The project by Stella Speziali takes the form of three separate boxes, along with an Oculus Rift headset. When a hand is placed in one of these boxes, the user is virtually transported to another dimension of sight and sound, controlled by IR distance sensors, flex sensors, capacitive wire, and several other devices interfaced with an Arduino Mega. Each box contains an IR distance sensor, which detects when a hand is inserted and display the virtual world attributed to the box. This new virtual world surrounds the user. A sensor is placed on each wall within the boxes, this sensor recognizes the hand and activates an animation inside the virtual world. I tried to map the sensors in the virtual universe so that a little clue is given to the user and will lead him to trigger the animations. The idea behind this installation is to go beyond “traditional” VR controllers for entirely new level of interaction. The video seen here gives an excellent preview of the strangeness of this type of interface, though using it with a headset and sensors would likely be an altogether different experience! [Florian] has been putting a lot of work into VR controllers that can be used without interfering with a regular mouse + keyboard combination, and his most recent work has opened the door to successfully emulating a Vive VR controller in Steam VR. He uses Arduino-based custom hardware on the hand, a Leap Motion controller, and fuses the data in software. We’ve seen [Florian]’s work before in successfully combining a Leap Motion with additional hardware sensors. The idea is to compensate for the fact that the Leap Motion sensor is not very good at detecting some types of movement, such as tilting a fist towards or away from yourself — a movement similar to aiming a gun up or down. At the same time, an important goal is for any added hardware to leave fingers and hands free. 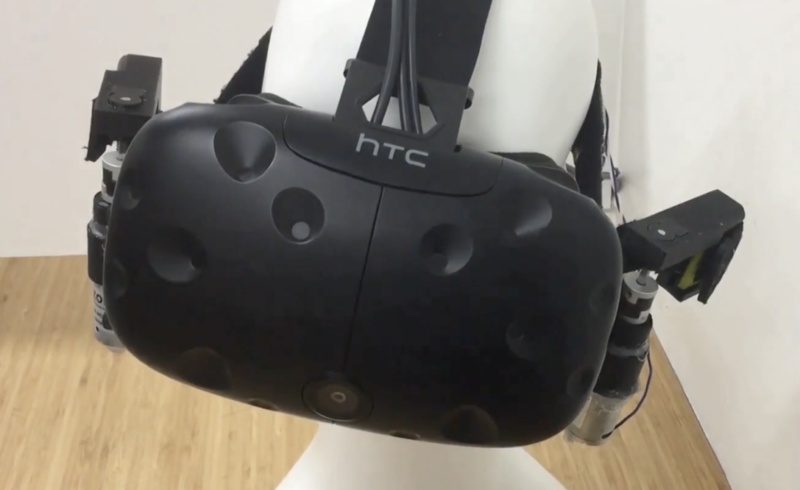 [Florian]’s DIY VR hand controls emulate the HTC Vive controllers in Valve’s Steam VR Tracking with a software chain that works with his custom hardware. His DIY controller doesn’t need to be actively held because by design it grips the hand, leaving fingers free to do other tasks like typing or gesturing. 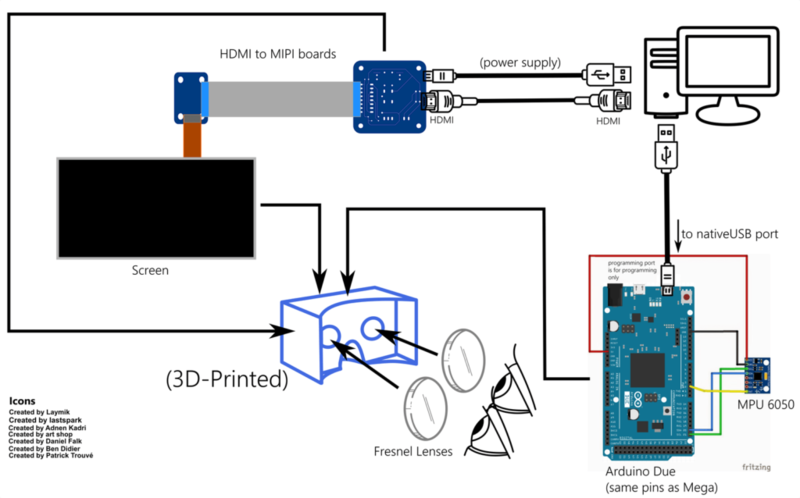 We have DIY hardware emulating Vive controllers in software, and we’ve seen interfacing to the Vive’s Lighthouse hardware with DIY electronics. There’s a lot of hacking around going on in this area, and it’s exciting to see what comes next. I always wanted to shoot things in virtual reality but I'm broke so I did what I could. This is my attempt at an Oculus Rift style experience with Google Cardboard. This is actually a really fun project and its extremely easy to replicate. The parts cost around $15 total and will take about 45 minutes if you are new to Arduino. This is a really easy project that can be done in about an hour. It is more of a virtual reality experience rather than a game. 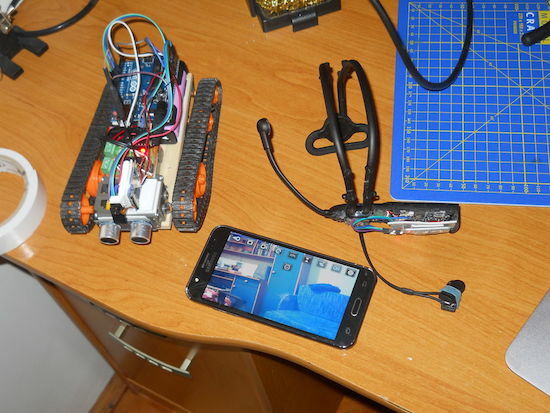 An accelerometer/gyro goes onto an Arduino board and transmits the angular motion of the board via bluetooth to a (extremely amateur game) I made in Unity for Android phones. This only works for Android phones and your phone must be compatible with Google Cardboard.